When inclement weather, natural disasters and other emergencies happen, clear communication between healthcare providers, their communities and their patients is critical. You want to operate your practice even if no one can physically get into the office. So how can you make sure that power outages, mandatory evacuations and the like do not leave you in a lurch when disaster strikes? Most traditional answering services depend on power sources, land lines and cell towers to manage clinical communications. But when powerful storms, for example, pummel your region with high winds and flooding, land lines and call towers become obsolete. 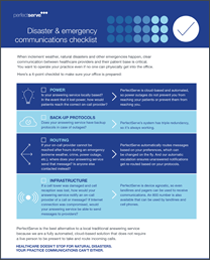 Download our 4-point disaster and emergency communications checklist to make sure your practice stays operational even when your answering service isn’t.